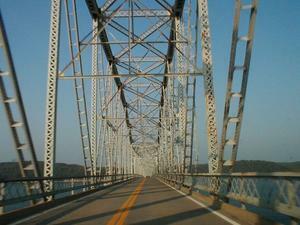 Interstate 24 enters the state when it crosses the Ohio River into Kentucky from Illinois west of Paducah. The road crosses the Tennessee and Cumberland Rivers north of the Land Between the Lakes and then exits the state into Tennessee south of Hopkinsville. 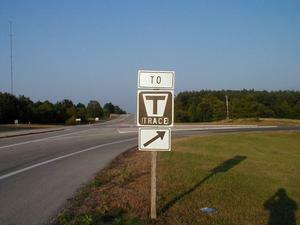 I-24 was the last of Kentucky�s major interstates to be complete. It was fully opened to traffic in 1980. I-24 is the only interstate in Kentucky that currently has an associated business route. Business Loop I-24 goes through downtown Paducah. I-24 through Kentucky is 93.373 miles long. FAI 24 Bridge Over the Ohio River - Information about a late-80s project to rehabilitate I-24's Ohio River bridge. H.B. Elkins: Interstate 24 - A guide to Interstate 24 in Kentucky. Illinois Highway Ends: I-24 - Information about I-24 in Illinois. KentuckyRoads.com: I-24 Bridge over the Ohio River - A photograph of the I-24 bridge over the Ohio River downstream from Paducah. KentuckyRoads.com: I-24 Bridge over the Tennessee River - A photograph of the I-24 bridge over the Tennessee River downstream from Kentucky Dam. Contracts for the first phase of a project to extend the Edward T. Breathitt Pennyrile Parkway to I-24 are scheduled to be let in November. Construction may begin as early as April. The first phase will extend the parkway to the US 68 By-pass around Hopkinsville. The Kentucky Transportation Cabinet has allocated $3.5 million for acquisition of right-of-way for a project to widen US 641 between Marion and Eddyville. This money is for the first phase of the project—a 5.6-mile section in Crittenden County. Construction is expected to begin on this section in 2007. After initially declining to study possible routes for I-66 through southern Illinois, it seems that Illinois and Missouri residents are now hoping to have the route built between I-24 and a new bridge over the Mississippi River at Cape Girardeau. Kentucky is in the process of a feasibility study to determine the best route for I-66 between Paducah and the Mississippi River near Wickliffe. Transportation officials announced at recent meetings in Western Kentucky that final designed for a new four-lane US 641 between Marion and Eddyville should be complete by December 1. The Kentucky Transportation Cabinet Division of Planning has posted a few new maps of preliminary study corridors for I-66 in western Kentucky. The Kentucky Transportation Cabinet will unveil the final decision on the route for an extension of the Edward T. Breathitt Pennyrile Parkway from its current terminus near Hopkinsville to I-24 at a public meeting scheduled for August 20. The extension is expected to cost $79 million and will fill the seven mile gap between the end of the parkway and the interstate. The KYTC has also announced that there will be no permanent closures of state or county highways along the route. Funding has been restored to build an extension of the Edward T. Breathitt Pennyrile Parkway from its current terminus near Hopkinsville to I-24 south of Hopkinsville. The Kentucky New Era reported on April 6 that State Senator Joey Pendleton believes that it is likely that funding will be restored for the extension of the Breathitt Pennyrile Parkway to I-24. The budget bill passed by the state House of Representatives did not restore funding for pre-construction work for the extension of the Edward T. Breathitt Pennyrile Parkway to I-24; however, State Senator Joey Pendleton (D-Hopkinsville) hopes that funding will be restored in conference committee meetings this weekend. In an earlier article, Pendleton had indicated he believed that the project would be added to the bill before its passage on Tuesday. State Rep. Jim Bruce denies a role in the funding delay for building an extension of the Edward T. Breathitt Pennyrile Parkway from it current terminus near Hopkinsville to I-24. Funding for the project has been delayed from 2003 to at least 2005 in the new 2002 Six-Year Highway Plan. There is no formal record of how changes to the plan came about: it was conducted behind closed doors just like much of Kentucky politics has been done for 200 years; however, Rep. Bruce has been widely sighted as the cause for the delay. Hopkinsville and Christian County officials say that the proposed extension is very important to development in the area. In a bit of old news, this June 28, 2001 article in Hopkinsville's Kentucky New Era reports that recently approved funding means that the KYTC will be able to move ahead on right-of-way purchases for an extension of the Pennyrile Parkway from Hopkinsville to I-24. Update 3:56pm Nov. 8: Here is a Jan. 31, 2001 article about the extension to the parkway.